-Has been one act after another of a gracious God on my behalf. I had a short week because of attending Allume. God multiplied my time. God allowed the insurance auditor let me fax and email our info instead of having a face to face appointment. God allowed everything to get done that needed to get done. And then some. -I read a great book. The Girl You Left Behind by JoJo Moyes. It is a novel split between WWI and the present day and centers on a painting. Loved it. And I am hoping I can find more of her books in our library system. -We had our first hard frost of the fall. Which effectively killed my vegetable garden. But, we had an almost 5 month run this year, so that in itself is pretty impressive. 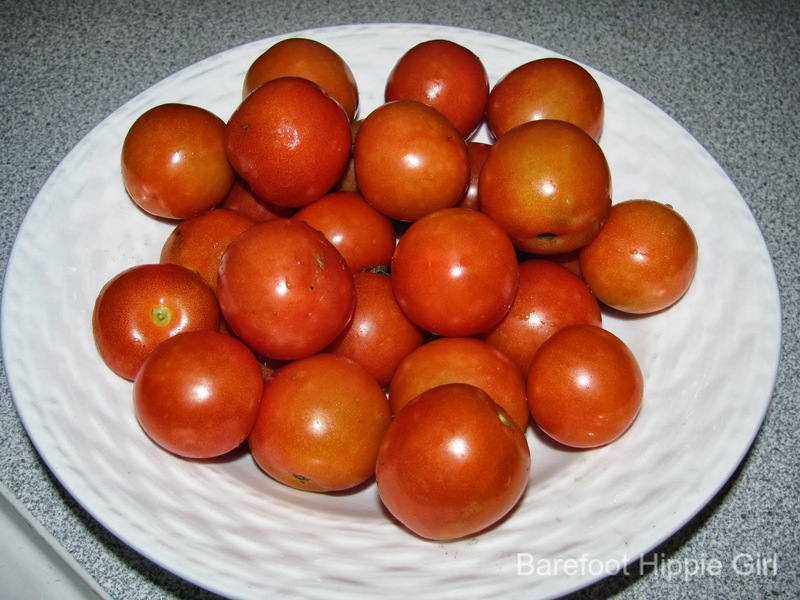 We have a bowl of cherry tomatoes waiting to ripen. The plants and fencing will get pulled up and either composted (plants) or stored (fencing). -Not only did it freeze, we had snow flurries. Crazy! 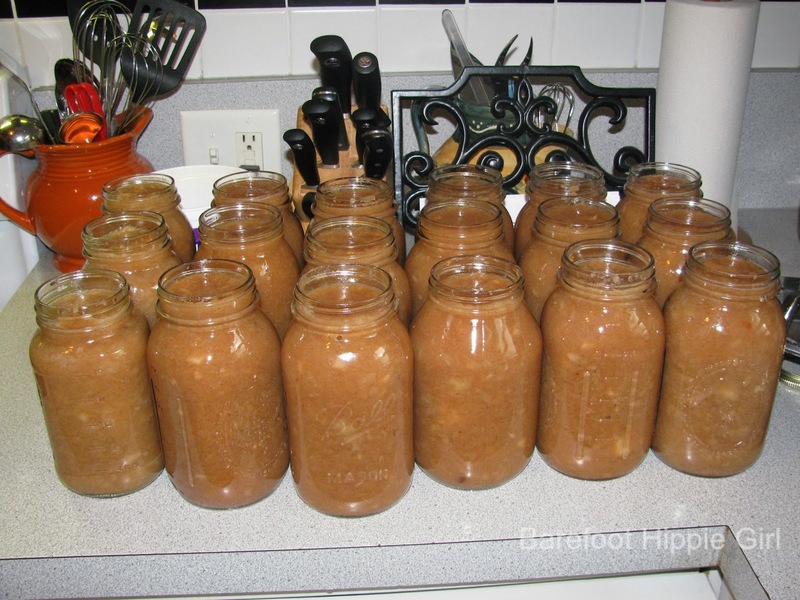 -I made 18 quarts of applesauce, which gives me a grand total of 45 for this year. We have picked (out of a crate) 5-1/2 bushels of apples so far. I will be making another 18 quarts of applesauce which will leave me with less than 1 bushel for eating and candied apples and apple pies. We might need to get some more apples. -LC was also in tears because she vacuumed up a hanky. But, thanks to our new Dyson vacuum, fixing this problem was the simple the touch of a button. -And just what is up with the off-spring and tooth loss? In the past 2-1/2 weeks, 5 teeth have fallen out-spread out between 3 kids. I didn't even know we were scheduled for this. -Meres' favorite activities these days is getting a nug (hug) and going to BSF. She wakes up every morning hoping this is her morning to go. She loves the snacks, songs, puzzles, toys, and stories. I am glad that she is able to attend. -We have now completed our first 8 weeks of school. They have been busy but really good. I feel like I am learning as much as the kids. 8 weeks down means we are about 1/4 of the way done. Wow! 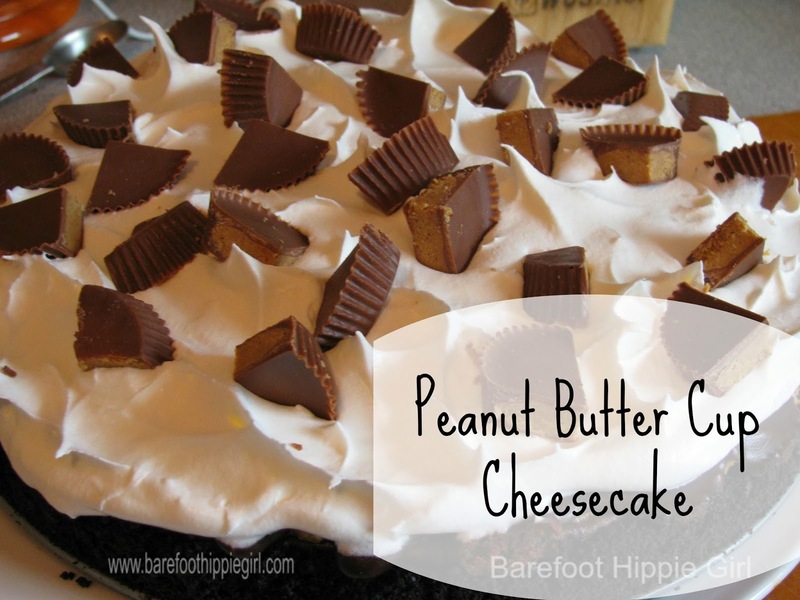 -Well, today, just because I can, I am sharing with you a wonderful Peanut Butter Cup Cheesecake recipe. I am not the biggest fan of cheesecake. It's an associative memory thing. I used to love it, but the night before Freckles was born I had a gigantic piece of plain cheesecake covered with fudge and caramel. It didn't survive labor well. If you get my drift. I still like cheesecake, but I generally will pick a different dessert option when given a choice. Unless I am in one of my rare cheesecake moods. Then I want something rich and chocolaty. This Peanut Butter Cup Cheesecake fits the bill. There are essentially four layers-crust, chocolate, peanut butter and ganache. This combines to form a giant peanut butter cup. 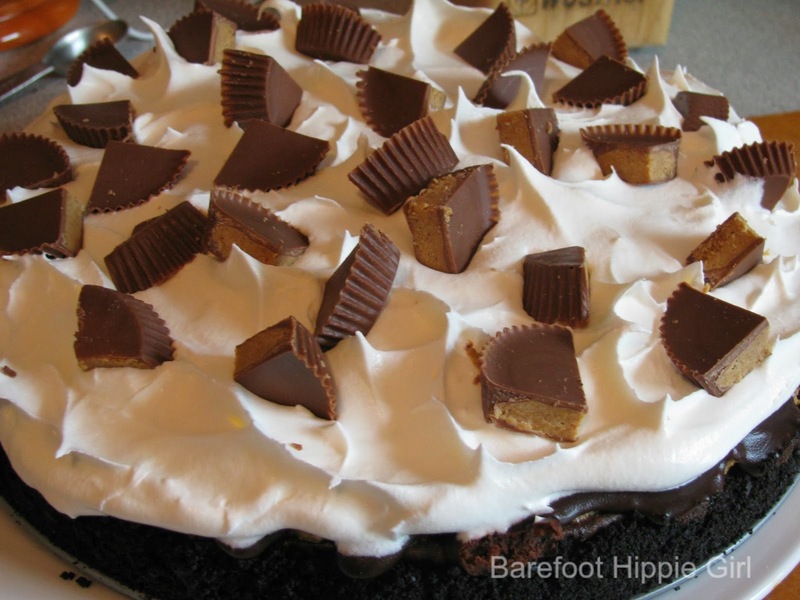 Which is then topped with whipping cream and genuine peanut butter cups. Hands on time was around 45 minutes. Combine the cookie crumbs and butter. Press into a 9 inch springform pan that has been lined with parchment paper. Set aside. In a mixing bowl, beat the cream cheese and sugar. Add the peanut butter, egg, and vanilla and cream again. Set aside. In a small sauce pan, melt the chocolate chips over medium heat. After they are melted and creamy, add the cream cheese and stir until creamy again. Whisk in the milk and vanilla. Crack the egg in a small bowl. Add a large spoonful of the hot chocolate mixture to the egg and whisk immediately. Then pour into the chocolate mixture in the pan and whisk again. Pour the chocolate mixture onto the cookie crust. Gently spoon the peanut butter mixture on top. Start placing spoonfuls on the outside edges first, then drop spoonfuls in the center. Carefully smooth out the peanut butter layer. Bake at 300* for 55 minutes. Remove right away and place on a wire rack to cool. Place in the refrigerator to chill completely. In a small saucepan, bring the whipping cream to a boil. Remove from the stove top and stir in the chocolate chips until melted. Pour on the top of the chilled cheesecake and smooth over the top. Let set. Top with Cool Whip and chopped peanut butter cups before serving, if desired. Cut into 14 wedges.